Medieval music and dance CD's! Here we have on CD the Pilgrimage to the Shrine of St. Mary, Chevrefoil, C'est la fin Dance of the Middle Ages and Exiled Medieval Music CD. As well as wide range of New Age music, meditation music, and Instructional guides from both large and independent publishers. We hope that you'll find selections here that aid you in setting the mood for your magical craft, meditation, and spiritual growth. The A Time for Us CD by Armand and Angelina is best summarized by the following: In the beginning God created Classical music... Then man discovered Rock-n-Roll. And now the ultimate hu-man experience... World Popera. The Armand and Angelina Sing the Secret CD features 12 original songs affirming the Law of Attraction featuring narrative quotes from Rhonda Byrnes phenomenal book and DVD, "The Secret". 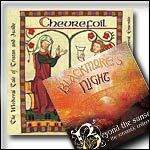 Beyond The Sunset - The Romantic Collection, Renaissance style music CD from Blackmore's Night. Released in 2004, the compilation album, features Ritchie Blackmore and Candice Night. 14 songs. Total time 58:41. The Calya Journey-Wise, Magickal Meditations CD explores that at the smallest level, we are all quantum VIBRATIONS. Different parts of our bodies resonate and respond to various frequencies. The Celtic Cosmos by Jerry Marchand CD includes Celtic Cosmos, Tale of a Comet, Solar Winds, Earthrise, Rings of Saturn, Dark Isle. Tristan and Isolde in Poetry and Music. Our Chevrefoil Medieval Music CD created by Istanpitta Medieval Early Music Ensemble. Instruments Include: Medieval harp, vielle, oud, lute, recorder, saz, Medieval bagpipes, psaltery, tabla, riqq, and tabor. Exiled Medieval Music CD is a collection of Sephardic Songs and Middle Eastern Dances performed by Istanpitta Early Music ensemble. Fires at Midnight, Renaissance style music CD from Blackmore's Night. Released in the USA, July 2001, the album, features legendary guitarist Ritchie Blackmore and vocalist Candice Night. 17 songs. The Chakra Healing Chants by Sophia CD will allow you to embark on a journey through the power of the Chakras on a river of sacred sound with legendary 'Song Healer' Sophia with David Gordon on shaman drums and native flutes. Color Meditation: Align Your Chakras by Margaret Ann Lembo This guided meditation is approximately 20 minutes long. Deep Within a Faerie Forest by Stadler/ Rule CD rediscovers the magic - Become filled with exquisite beauty as you journey into a mystical land of dreams. Drum Medicine CD features tribal drums from all over the planet, soaring native flutes, guitars, Shamanic atmospheres, spirit rattles and natural sounds awaken you to the dance of life. The Crossing at Rainbow Bridge by Jerry Marchand CD includes five tracks, each song is an intricately woven tapestry, layering the moving notes of plucked harp strings with the song of the flute, keyboards, and bowed psaltery. Pilgrimage to the Shrine of Saint Mary Music CD. Collection of songs about Saint Mary and the Miracles she performed in Spain. Many stories of miracles performed by Holy Mary were exchanged among these travelers during the Middle Ages. Ghost of a Rose, Renaissance style music CD from Blackmore's Night. Released in the USA, July 2001, the album, features Ritchie Blackmore and Candice Night. 15 songs plus 2 bonus tracks. Total time 60:19. The Garden of Serenity by Gordon/ Gordon CD is the meditative interplay of natural sounds and enchanted music creates a healing, mentally cleansing and stress-free environment. Hooded Man: Celtic Harp Music by Jerry Marchand CD was inspired by tales of Robin Hood and Maid Marian, Celtic harpist Marchand presents fourteen soft and gentle instrumentals which describe "The Blessing of Sherwood Forest" and other scenes from Nottingham in days of old. Knight's Journey: Celtic Harp Music CD by Jerry Marchand is a harp guided trip of music reminiscent of of what one would of heard had they lived in a time when knights roamed the land. Lady of the Lake CD by Jerry Marchand is full of elegant harp music, Jerry Marchand performs in this album, accompanied by the sounds of the bowed psaltery, hammered dulcimer, and the hurdy-gurdy. Meet Your Master Guide: A Guided Meditation by Margaret Ann Lembo CD is a guided meditation is approximately 20 minutes long. Merlyn: Celtic Harp Music by Jerry Marchand CD displays Marchland's mastery of the Celtic Harp, along with vocalist Laura Cayer, this music is extremely gentle & soothing. Gratitude by David & Steve Gordon CD transports you to an ancient land where the sun sets in warm hues of perfect stillness. Meditation Drum by David & Steve Gordon CD creates a serene environment of inner peace and enjoy effortless meditation with this ambient drum music. The Reiki Love Meditation CD by Armand and Angelina is a 60 minute composition suited for Reiki treatments, meditation, yoga and massage. The Hotter Than Ever CD by Armand and Angelina was recorded live at the Unity of Christianity of Orlando, FL. Hear Armand's inspiring messages and thought provoking, personal journey songs and Angelina's classically inspired songs and melodies. The Kissed by an Angel CD by Armand and Angelina takes a mystical journey as you travel through a variety of Celtic, Mediterranean, and Native American soundscapes. The I'm a Disney Freak CD by Armand and Angelina is a compilation of 22 of Armand's most beloved compositions including many humorous songs like "How Can I Miss You(if you won't go away)?" and "Hugh Manatee". The Our Neverending Story CD by Armand and Angelina is Armand and Angelina's 2nd P'opera CD and their most fully self expressed music. Enjoy their new sound that took a decade to birth with many of their most popular performance songs. The Orchestrating The Symphony Of Our Cells CD by Armand and Angelina speaks to all of the solutions to any situation exists in our holographic brain-access is through these simple techniques. Shadow of the Moon, Renaissance style music CD by the musical group Blackmore's Night. Their first album, featuring legendary guitarist Ritchie Blackmore and vocalist Candice Night. 1997, 16 songs. Under a Violet Moon, Renaissance style music CD from Blackmore's Night. Released in the USA, July 1999, the album, features legendary guitarist Ritchie Blackmore from Deep Purple and vocalist Candice Night. The Village Lanterne Music CD from Blackmore's Night featuring Ritchie Blackmore and vocalist Candice Night. Renaissance Style Music. The Secret Voyage Music CD from Blackmore's Night featuring Ritchie Blackmore and vocalist Candice Night. Renaissance Style Music. Sacred Earth Drums by Gordon/ Gordon CD features drums from around the world join with Native American Flute, Incan Pan Pipes, Spirit Rattle, Guitars, Keyboard textures, and Sounds of Nature (including Wolf, Eagle, Coyote and Dolphin). Short Meditations for Busy People: Relieve Your Stress! The guided meditations on this CD are suitable for the stressed executive, the over-scheduled mother or the creative genius. Twilight: Celtic Harp Music by Jerry Marchand CD is a nine track journey with his harp, accompanied occasionally by the flute, guitar or keyboards. Zero by Wendy Rule CD is an album of lavishly orchestrated, ambient pieces of crafted music. The Sacred Flute Journeys CD by Armand and Angelina gives voice to the sound of the wind, while transforming into songs of beauty, this music will soothe, heal and tell of the Creator's gifts.